IT leaders in the manufacturing sector, like Dennis Hodges, CIO of Inteva, a $2.5 billion automotive parts maker, have had to implement IIoT before 5G and other new technologies are ready for prime time. Unless you have been living under a rock for the past couple of years, you are familiar with the Internet of Things (IoT). You have probably heard a little bit as well about the grizzlier version: the Industrial Internet of Things (IIoT). We all know the future – devices speaking the same language over 5G networks in real time providing a digital representation of manufacturing, where the only human involvement is counting the vast sums of money created by all this efficiency. Sure, computers could count the money, but then, what fun would that be? Unfortunately, not all of us have the luxury of waiting for that day in the future to implement IIoT. 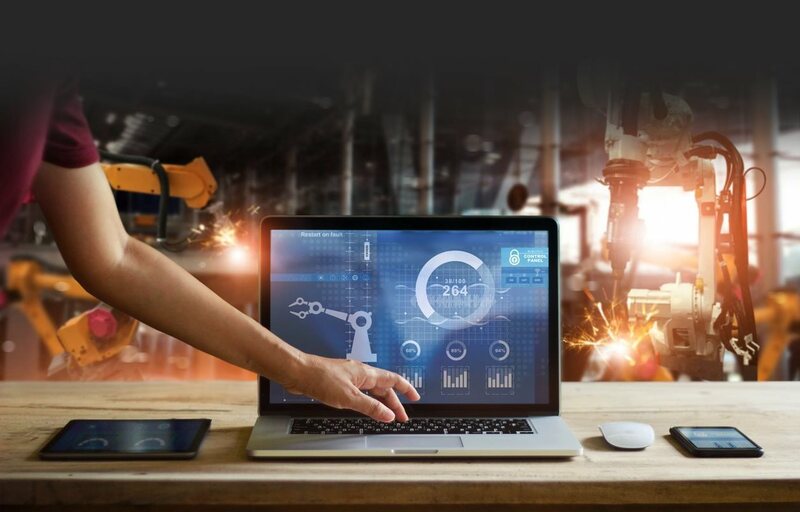 In the automotive supplier world, which is my world, the predecessors of IIoT – traceability, error proofing, part production validation – are being forced upon us with rapidly evolving customer requirements. Of course, there are legitimate reasons for this pressure. Just think of the company Takata, which made airbags. Failure to produce a reliable product caused a firestorm of warranty related recalls starting in 2014, and forced a long-term supplier into bankruptcy and oblivion. I use the term “production micro-environments” to present an image of one device in a collection of non-collaborating equipment on the shop floor. With service lifecycles measured in decades, and costs often measured in millions of dollars, we are faced with utilizing equipment that is not always prepared for the future. However, the customer doesn’t see that as a reason to not manage the process, so we must improvise. There is a substantial ecosystem dedicated to converting analog communications signals into digital information. While not intelligent, the migration from manual to digital recording has improved accuracy and efficiency. This data, along with management of the device through Manufacturing Execution Systems, gives the plant personnel the ability to drive the management of part production. As the devices produce data, trace and error proofing are often times being managed at the local device level. The goal is then to get this information into production recording systems, such as an ERP. This was often done on an asynchronous schedule using a backflush method, allowing the production system to inform the ERP of material consumption, etc. This backflush scheduling has moved from increments of weeks, to days, to hours, allowing the operation to better manage inventory, and therefore, working capital. The advent of APIs and more open ERP tables is moving this information flow from weeks to individual parts or process routings. The most critical evolution is the interface to the operations staff. The manual recording of production is still a fact for many manufacturers. Variances in performance were often measured daily at best. As technology between the production equipment and ERP improved, monitors were installed to show the data coming from each system. Operators became inundated with data and were not able to realize value from it. Now, the ability to present the critical data to operators and plant staff is here. At Inteva, large screens and Raspberry PI computers provide the ability to saturate the production environment with a walk by analysis of production. At the operator level, the synthesis of production data with other shift-related variables allows for variance tracking in real time. Plant management can tune into a dashboard showing overall production and drill down into any trouble spots. Building an ecosystem that can meld these components into a cohesive architecture is a rapidly evolving art, if not science. Advances in the three areas described above don’t usually move at the same pace. Therefore, the designer must be developing with the mindset of constant change. The good news is that the framework for IIoT is bringing relief to the manufacturing community as larger IoT improvements continue to be adopted. Technologies that improve network connectivity are allowing for faster setup and implementation. 5G wireless technologies that can function in the faraday cages of plants along with devices built for this networking will reduce the capital and planning cycles for installing machines and getting them connected. Thought leaders such as SightMachine are incorporating intelligence, analytics and synthesizing information to drive device performance, monitoring and oversight through the digital twin concept. This allows the manufacturer to manage both sides of production equipment – keeping up with what’s being built and also understanding and managing the health of the device. This results in more productive equipment that lasts longer. Improvements in the man-machine interface are also creating new opportunities to better manage the overall process and improve worker safety and morale. In countries where the economy is strong, operations personnel have many choices for where to work. Creating a value adding, interesting work assignment is another benefit from this evolution. Over the past decade, consumer technology has radically changed and improved. Industrial application of this technology has often fallen on the manufacturer, which has created some challenges. But as IIoT catches on, it offers the promise of satisfying the three constituents of manufacturing: the customer, the supplier, and the employee.